Consolidating websites so the original solemodel.org now points here. 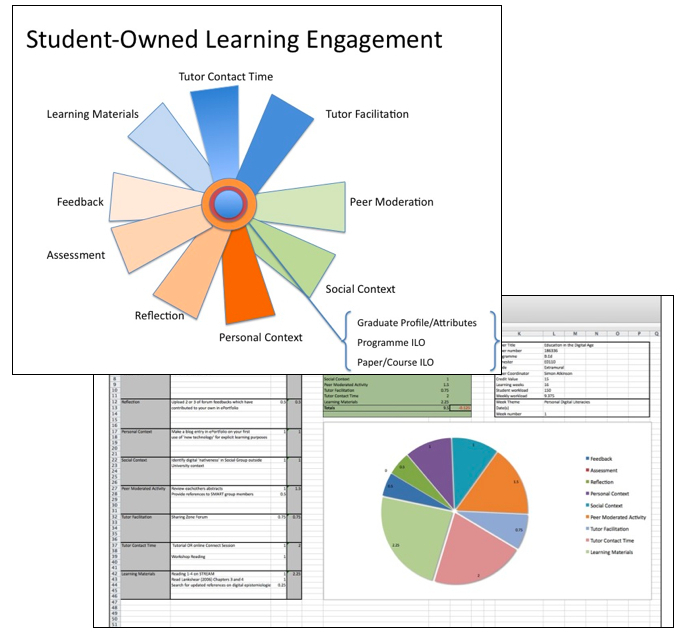 The Student-Owned Learning-Engagement (SOLE) model began in 2006/7 as a conceptual, and practical, model of the learning experience as it is worked through by the learner themselves. The model's nine elements represent a holistic and comprehensive experience across individual and social boundaries, capturing intellectual, socio-cultural and connectivist processes. The model serves to support learning designers, course designers and instructional designers in ensuring that comprehensive learning opportunities are balanced and constructively aligned. This is made possible by providing a deliberately 'low-tech' toolkit to facilitate design processes and make transparent the relative weight and duration of learning tasks and activities. As the toolkit has been updated the stress has remained on an Excel Workbook to be shared with the student as an advanced organiser but importantly it remains a stand-alone design instrument. Only the basic functionality available in Microsoft Excel has been used to ensure that the toolkit is also compatible with other spreadsheet applications. At its core is the SOLE model's supports the notion that students learn most effectively when they take ownership of and responsibility for their own learning. The SOLE Model (Student-Owned Learning-Engagement) was originally conceived of as a response to Professor John Biggs and his work on Constructive Alignment, Professor Diana Laurillard’s influential ‘Conversational Framework’ and Professor Grainne Conole’s work on Toolkits and embedded pedagogy. More recent implementations of the toolkit have been informed by work on learning object sequencing and other work on educational taxonomies. As a result of the language used in the SOLE Model in its implementation in the toolkit now using active verbs, Assessment becomes Assess for example. As an educational developer and academic, it has often been difficult to engage those outside the educational discipline in a discussion about pedagogical practices in a meaningful way. The need to develop practical and effective ‘tools’ to assist in pedagogical planning is evident. The LDSE (Learning Design Support Environment) project in the UK is a manifestation of this. However, the experience of developing engagement materials for digital repositories with the DiAL-e Framework has suggested strongly that academics not only require embedded professional development materials but also ‘toolkits’ which require little effort in adoption. The SOLE project extends the work of the DiAL-e in seeking to use only ubiquitous desktop applications to support the pedagogical design process. Visit the appropriate Toolkit pages from the PAGES menu on the right-hand side of the screen. See 'publications' for further details.